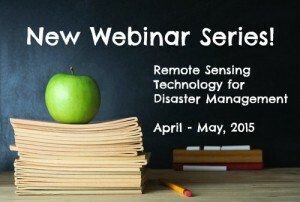 The CEOS Working Groups on Capacity Building & Data Democracy (WGCapD) and Disasters (WGDisasters) offered the WGCapD Distance Education Course, A Webinar Series on Remote Sensing Technology for Disaster Management (DM) from April to May, 2015. This course consisted of a comprehensive series of eight introductory webinars that addressed the use of remote sensing technology for DM. The recorded sessions and presentations are now publicly available. Please find here the Lessons Learned Report and the journal article (Ferreira H. S. et al., International Collaborative Online Education Program: Geospatial Technology Applied to Disaster Management. Revista Brasileira de Cartografia, Rio de Janeiro, N. 69/1, p. 1-11, Jan/Fev/2017). Provide access to expertise from space agencies around the world. Link participants to a global network of experts and policymakers. Create awareness about international coordination bodies, such as CEOS, Group on Earth Observations (GEO), United Nations Office for Outer Space Affairs (UNOOSA), and the International Charter for Space and Major Disasters. Provide access to datasets and useful tools available from CEOS Members. Help participants enhance their DRM skills.